So if you hadn’t noticed the biggest sports tournament on earth, The World Cup begins tonight in Russia. Over six weeks 3.2 billion people will get a reprieve from Donald Trump’s headline-grabbing antics. The World Cup has become the lingua franca of the world, watched by more people than any one event on earth. Many of the 32 teams represented at the games hold up the hopes of billions of football fans everywhere, but many of those teams remain outside chances of progressing through the group stages. One of those teams in particular that have managed to capture our hearts in the last few years are the tiny nation of Iceland; numbering around 350,000 people. They are relatively new to the international game, in fact, it was only two years ago that they sailed into their first major tournament, the UEFA Euro 2016, after home and away wins over the Netherlands. Far from being a football powerhouse, their 23 man squad have catapulted themselves onto the global stage since beating England 2-1 at that very same tournament, in what some say was one of the greatest sporting upsets in recent memory. So bad, that England’s manager Roy Hodgson quit the next day. While Iceland remains at 250/1 odds at this year’s World Cup, it would be impossible to write them off completely. 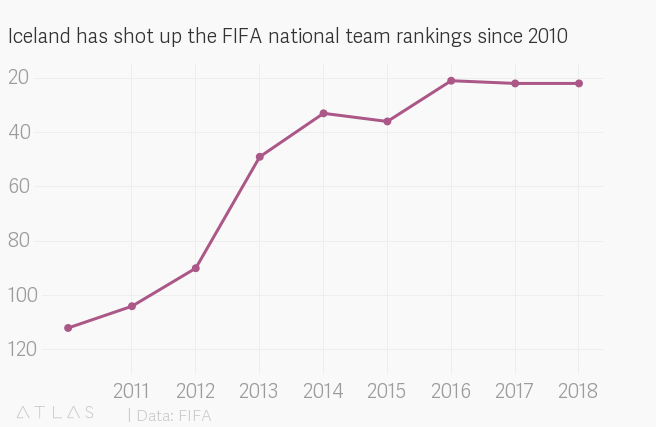 You only have to look at their ascent of the rankings on the global stage since 2010 to see what we mean. Their performances over the last few years have managed to impress pundits everywhere, playing surprisingly well-rehearsed football, beating teams 10 x their power and influence such as Austria, England and Croatia, not to mention tying with Portugal. Yet, they are by far the smallest team on population ratio to ever qualify for the World Cup. So what makes them so endearing? They are essentially a rags to riches story coming from nowhere to overcome all odds facing up to teams no matter their star power or financial backing. Not to mention the cast of incredible characters in the team, their coach Heimir Hallgrímsson is a part-time dentist who discusses all the strategies and tactics of their performance with fans at the pub before every game. Their fans never leak any information about it. Their goalkeeper Hannes Halldórsson is a talented film director who also crafted this ad in the leadup to World Cup 2018. All kookiness aside, they take football very seriously possessing great players like Everton’s star midfielder Gylfi Sigurdsson and striker Alfred Finnbogason who plays in the Bundesliga. They also have an incredibly well-versed country in the game with one registered coach for every 550 people, that means 600 coaches in their country, and more UEFA-licensed coaches per capita than powerhouses Spain, Germany and England. While their group contains top-notch teams like Croatia, Nigeria and Argentina, we know one thing, the World Cup is not always about individual brilliance. Players like Messi and Ronaldo have never won a Golden Trophy, it’s about strength in numbers and unity, and Iceland has shown that time and time again with their fearless, soulful performances.